Anna Maria Horner: You may have this dance! You may have this dance! Here she is! The Folk Dance quilt pattern is ready for downloading, printing, cutting, sewing, backing, quilting and binding! Got a few spare weeks? Me either. But I'm excited to share this pattern with you nonetheless. The pdf is linked over there in the sidebar at the top of the other quilt patterns and also on the products/sewing page of my website. You must be told too, that making these sorts of updates to my website without calling Jeff, makes me so happy. Not nearly as happy as it makes him, but happy. 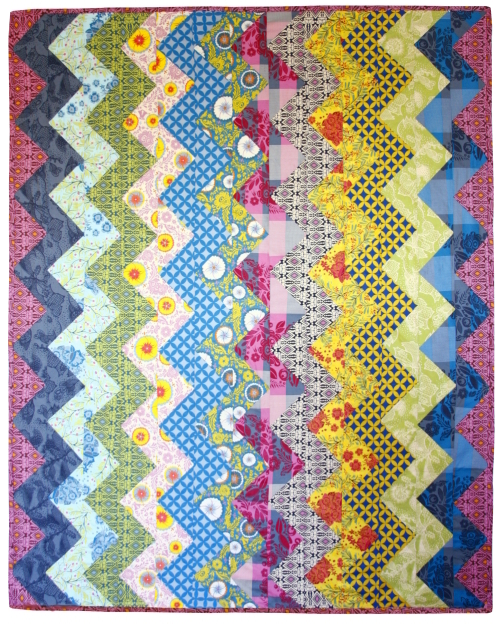 I have seen zigzag quilts cut and assembled a few different ways, a few googles and likely you would too. Often they are squares made up of two right triangles, and the zigzag lines just appear based on which way you turn and alternate the square as you go. My pattern is based on an antique quilt that I came across (which of course I can't find now) that was just vertical columns of larger right triangles alternating their color and direction. Then all the columns are sewn in straight vertical seams. Either method gets you the same visual result, I just liked the idea of less cutting, and also less piecing, and thought you might too. With this method you also don't have to break up the visual imagery of the fabric quite as much if you are wanting each "stripe" to be of the same fabric. And maybe none of this makes any sense, but will make perfect sense once you've looked at the pattern. Hoping so anyway. The pattern details how to assemble the top and leaves it up to you for your favorite way of backing, binding, etc. There are several spots online to find out this info, and also my book details my methods for backing and binding in the tutorials section. Mine will get some handquilting along every zig and zag, at a pace yet to be determined. I'll share that with you as I go. Overall I am just very excited about the look of these zigzags, with this collection of fabrics in particular. There is something kind of silly but serious about it all at once. And the movement is something akin to the charm of a ripple crochet pattern maybe. Oh I've started one of those with the new yarns. Yea, like I mentioned, pace yet to be determined. I love this quilt so much it is beautiful I havent ever made a quilt before but I might have to give it a trY! How (beautifully!) intimidating! I wonder if I have the wherewithall to do a SMALL one-- 5 zigs, perhaps? I love this quilt. I have the complete fat qtr set, but would definitely get the kit, maybe in each color! Ha! my word verification was "maties." And I agree, your fabrics make great mates. Just gorgeous...thank you so much to give this to us, we know how much work into this...also thanks to your daughter for getting on her knees and getting this done with you. YAY!! thank you SOOOO much for sharing!!! Hi! If you made this in cheater cloth it would sell like crazy! I love this. I can't stand it. sweet deal! Thanks for putting the kits in the shop!!!! I just had to leave a comment... I LOVE this quilt! Truthfully, ever since I saw it behind Juliana, I've been inspired to make a zigzag quilt. Now I have a pattern too! Thanks! Also, I wanted to thank you ever so terribly much for the note a while back. It meant so much to me and just filled the rest of my day with sunshine! I just know we've got to meet one day! I just *adore* the energy of this quilt. I have not made anything this complex before, but I am so inspired by these fabrics - I'll be looking for the kits! If I start now it might be ready for one of my son's weddings (they are 6 and 1). That looks great! The fabrics really highlight the design of the zig-zag! Beautiful! Oh please can we have a kit of the darling bag made out of the oil cloth? And I'll probably have to have the quilt kit too...just like I had to have Bird on a Chain! Yes, I agree, it does seem to channel the feel of a good crochet ripple afghan. You know, I started a ripple afghan and then ripped it out because I had made it waaaay to big. My friend thought that I could have just turned it sideways to make all the rows vertical (and then I would have been halfway done), but I wasn't so sure that I would like that. Well, now that I see just how gorgeous and visually stimulating your quilt is.... well darn! Oh well, live and learn, and begin again. soooo gorgeous! my friends and i make collaborative quilts for one another as we (they) each get married and this pattern might just be a great candidate for the next one! i love it. adore the zigzags and of courese the colouring. Thank you for sharing this gorgeous pattern. The zig zags look wonderful. Thank you x 1000 Anna Maria!!! I saw that quilt on your New Years blog post (2nd January) & I new I wanted to make it - I never dreamed you'd share the pattern with us for free. Going over to the link now! Love.This.Quilt!!! So beautiful. I've never made a quilt before. But I LOVE this!! Maybe, just maybe, I'll give it a try. Would this be too hard for a beginner? I love it so much! You know how usually you see things and you want to alter them "just a bit" to make it more your own? This, I love just as it is and may make one just like it!! Lovely. This is just beautiful and shows off the Good Folks line so well. Thanks for sharing the pattern with us. I had previously made a zigzag quilt and this seems to make so much more sense. This is quite a show stopper!! wow! Wow. It turned out so beautifully! I love how colorful it is, and I love the movement it evokes. Great design! My almost three year old son just walked up to see what I was looking at on the computer this morning and spotted this zigzag quilt. He said to me, "I want to color like THAT, Mom." So, Anna... Thumbs up! It's a winner! Beautiful quilt and amazing fabrics. I get wait to get some. Thank you for sharing the pattern. I'm so excited to read that you are doing a ripple blanket. Would you be able to share some progress shots of the ripple and the crocheted hexagons you mentioned in an earlier post along with details of the yarn brands used? I'm wondering, though, why you titled it the Folk Dance quilt. I'm thrilled that you did, but so curious! Great quilt. Thanks for the download. The quilt is awesome!!! WOW! I read your story below and I know it doesn't compare but here's a little short story…I put on my pj pants a couple weeks ago and they were too tight to wear - I nearly cried myself! Then I look at my big belly and I'm good with it ;) I never knew I'd get so big… everywhere! What a great download - such a wonderful quilt!! Okay, so as a soon-to-be newbie sewer (is that even a word), I need some advice... any ideas on what my first few projects should be, besides just re-hemming a few messed up shirts? I'm eager to be an awesome seamstress, but need some vision, first. HELP! I'm picking up my mom's old sewing machine today, and want to start on something asap. Any ideas?? Simply gorgeous! You are so very talented! I just ordered some of your fabric, I can't wait to get my hands on it!!! i love the less piecing business. thank you! jane is getting a zig zag quilt for her summer bed. i appreciate you sharing your tips. This is so gorgeous! I love it. Thank you for sharing the pattern, Anna Marie. Thank you for this joyful, inspiring quilt and the directions for it. I believe, however, there is a much quicker, more accurate way to make it. Sew long strips of fabric together. Having the seams of the fabric formed by these strips go from right to left in front of you, cut strips from front to back at a 45 degree angle. For your quilt as shown, you will need 8 of these front-to-back strips. Each fabric in the strip will be in the shape of a parallelogram. Cut 8 more strips but going at a 315 degree angle. Sew together these long strips, alternating between the two angles to form zig-zags. In your illustration on page 2 of your pdf, you would sew rows of strips instead of columns. Thanks so much for sharing this beautiful quilt pattern with us!! I've been looking for a pattern to make a quilt for my daughter's 30th birthday this year...this just may be the one!!! Love your blog, your fabrics and the wonderful way you inspire!!! Oh my god your blog is fantastic!!!! I recently found out about it..how do you manage? Doing all those things at once? Well done, keep up the good work!!! You inspire me!!! Wow!!! you are officially amazing!!! sooooo talented. This is absolutely lovely! Yay!! I was hoping you'd post a pattern for this! I dreamed about the pattern after I saw it. In the spirit of Jung, I felt I must make one! Hi there, I love this quilt, and I'd love to try it, but I have a question. When you are sewing the "columns" together, don't you inadvertently loose the top tips of the triangles, b/c of the seam? What am I missing? I'm glad you're back to posting. I love reading about your shopping adventures and great finds. Your outfits are always super cute too! Very inspirational. Please come visit my site EadvertisingNetwork when you got time. nice blog and post i like the colors and the pattern Thanks for posting. Thank you so much for this pattern! I made a quilt for my son's daycare and actually hand quilted it - my first time! Enjoyable for the size that it was, but I don't know how easy it would be to tote around a full size quilt.